As TBS gears up to host its first-ever Final Four, the Turner network is pulling out all the stops on the promotional front. In a sense, the TBS marketing team’s challenge is to effectively help fans break a 32-year habit, inasmuch as the national semifinals have aired on CBS since 1982. While the various executions are literally too numerous to list, suffice it to say that the usual suspects are all in play. There are linear spots running in heavy rotation on TBS, TNT, truTV, CNN and HLN, a color strip ad in Friday morning’s USA Today, digital out-of-home displays in 31 markets, and an integration with NCAA.com. On game day (Saturday, April 5), TBS will tap a number of digital outlets, including Xbox, Pandora, YouTube, Spotify, Facebook and Twitter. A day-long homepage takeover of the USA Today site is also set to tip off tomorrow morning. Saturday also marks the debut of TBS’ Teamcast coverage, which is designed to super-serve diehard fans of Florida, UConn, Kentucky and Wisconsin. Along with the national broadcast on TBS, which reaches 98.6 million households, Turner will simulcast each game on two of its other networks. For example, when the Huskies and Gators square off in the first game, a Florida-centric telecast will run on TNT while a UConn-friendly presentation can be seen on truTV. The same applies to the 8:49 p.m. EDT game (Wildcats-Badgers). Whereas the primary telecast will feature CBS Sports’ Jim Nantz and Greg Anthony and TNT’s Steve Kerr, the Teamcast games will be called by announcers with ties to a particular team. For example, the UConn truTV simulcast will be called by CSN New England’s Eric Frede and former Huskies small forward Donny Marshall. Along with catering to each team’s fan base, the Teamcast coverage promises to generate some incremental ad sales revenue for Turner and CBS. 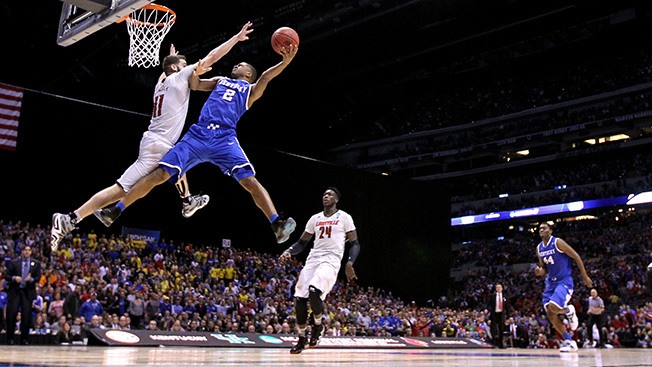 The 2013 Final Four averaged 15.7 million viewers and a 9.4 household rating, up 3 percent from the previous year. Louisville-Wichita State drew 14.5 million viewers and an 8.7 HH rating in the early window, while Michigan-Syracuse scared up 17.1 million fans and a 10.2 HH rating. Per Kantar Media, Turner and CBS together raked in $1.15 billion in March Madness ad sales revenue, marking the second consecutive year the two partners generated a 10-figure haul. The college hoops tourney beat out the NFL Playoffs and Super Bowl ($1.1 billion) and the NBA Playoffs and Championship Series ($929 million) for bragging rights as TV’s most lucrative sporting event. For what it’s worth, insiders say that the Kantar estimates are just a tiny bit inflated. The average price of a 30-second spot in the April 8, 2013 championship game on CBS was $1.42 million, up 6 percent from the prior year. The top advertisers in last season’s tournament were General Motors, which invested $80.7 million, AT&T ($70 million), Anheuser-Busch InBev ($38.9 million), Coca-Cola ($37 million) and Capital One ($36.8 million). All but A-B are official NCAA sponsors. AT&T, Coke and Capital One are official NCAA Corporate Champions, a term that denotes the three elite sponsors that invest north of $35 million per year for the privilege of aligning themselves with college athletics.